So after a full week of pool-side lounging and exploring your tropical destination, the final night of spring break is here. Time to let lose and hit the town for a night of fun! Enter the aptly named ‘Flirty Little Foldover.’ I wasn’t lying when I hinted that this was my favorite look of the spring break series, and now do you see why? The detail Kelly put into designing this little number shows she’s a girl who knows how to have fun. Take the removable chain, for instance. Totally transforms it from “Look how put together I am with my clutch for dinner with friends” to “It’s too late and I’m too tired to keep up with this now, thank goodness there’s a shoulder strap.” Haven’t we all been there? Feeding my turquoise obsession yet agin (thank you Kelly!) I’m thinking the gorgeous sky splatter weave pattern makes this baby the new Claire V. leopard clutch of the summer. Throw on with an all-white ensemble like I’m in above (my favorite trick for a super chic, super easy look), or amp up the fun with a bright mini dress. Either way, you’re set for another picture perfect summer night. Thank you so much for tuning in for A Lonestar State of Southern + Kelly Wynne‘s spring break series! I’ve had a blast putting together these looks, and hope they’ve inspired some spring wardrobe updates of your own. Let me know which look was your favorite, and what you’re up to this break! As for me? I’m stowing the spaghetti straps for a few more weeks and pulling out the coats (and new hat! )… this girl heads to Paris on Friday! Hyperventilating. This is my favorite bag of this series! Love the color .. I do not have a blue bag in my purse “collection” (haha) so this one might be the perfect addition! Have fun in Paris! Love the scalloped edges! I like your turquoise accents, too! How beautiful is this outfit! I am loving everything about the scallops, and the white theme. Have a great week! Love love love this outfit combination! 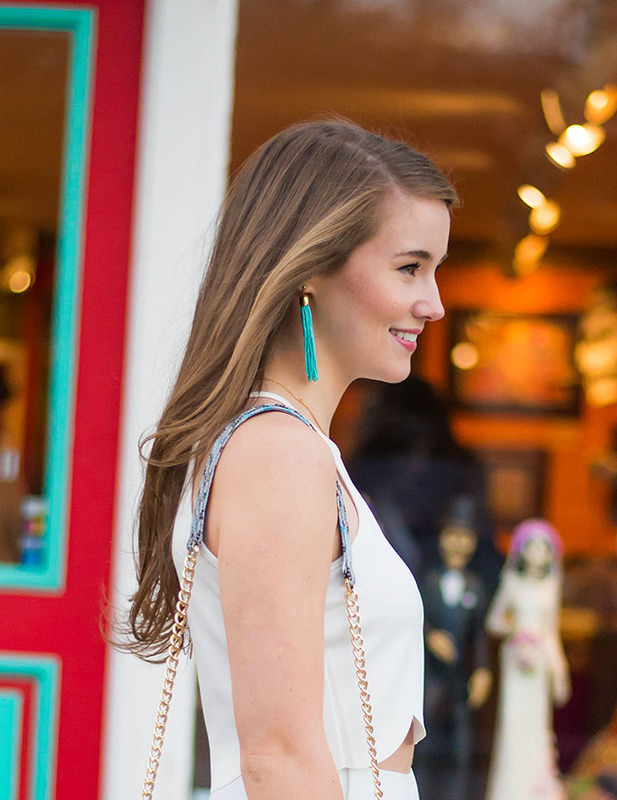 Your earrings match the blue accents in the background… It’s so perfect! I recently stumbled across your blog & it’s safe to say I’m in love. That clutch (& those earrings!) are absolutely to die for, so fun and flirty! Love the detachable strap and you are so pretty!